Deja vu all over again? I did a bit of a double take as I pulled the black box surrounding this whisky out of the calendar tonight. Day 18 of the KWM Whisky Advent Calendar is located right beside Day 13, and Day 13 was home to an identical little black box, belonging to Springbank distillery’s Hazelburn 12 Year Single Malt. Tonight’s neighbour box decided to forego the sister label and stick to the heart of the core brand, containing Springbank’s “benchmark whisky” (as KWM puts it), the 10 Year Single Malt. As you already know if you tuned in 5 days ago, Springbank is interesting because it’s one of only three distilleries left in the scotch region of Campbeltown, and by far the best known of the three. The Hazelburn label’s distinguishing features was that it was unpeated and triple-distilled; I don’t think either of those factors apply to the Springbank 10, which seemed to me to contain a bit of peat and which does not feature the hyper-literal three stills on its label like its sibling does. Should sister labels look identical in the package? My vote is “no”. My big issue with the Hazelburn was that I came out of it not really knowing how I was supposed to feel about it. It’s a little bit easier to align myself with the Springbank, which seems to have more of a confident identity to it, although the two whiskies are quite alike in many ways in terms of smell and taste. 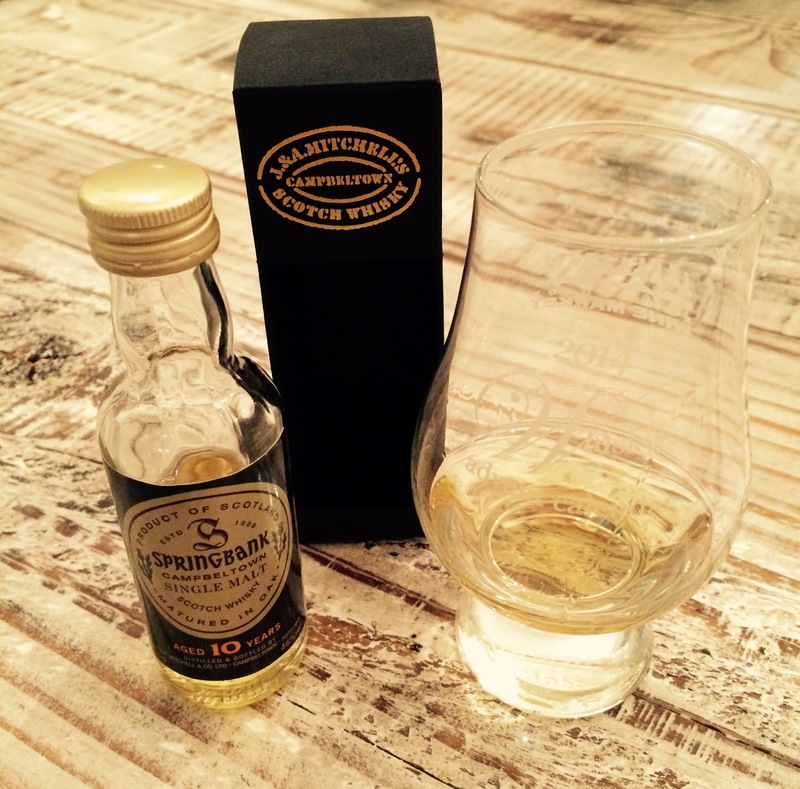 I wrote the tasting notes below for the Springbank 10 without going back and re-reading my Hazelburn writeup first — go back and cross-compare and the similarities will jump right out at you. The Springbank 10 was tragically/boringly aged in a mixture of bourbon and sherry casks (may you forever cease to torment me after next week, sherry casks), but thankfully the sherry influence is much more muted here than in other calendar whiskies that have come before. The first and enduring aroma on the nose is black licorice, which pairs up with malt, raisin, coffee and a vegetal undertone to form a friendly if somewhat basic flavour profile. The mouthfeel of the scotch is spongy, like honeycomb, and the palate matches honey-lemon Halls and menthol (lots of menthol) with vanilla, wheat and a touch of peaty organics on the finish. It’s not overly characterful or enthusiastic, but it is solid and precise, like a golfer who will never belt it 300 yards off the tee but who is always sitting just a little ways behind and in the middle of the fairway. At $67 retail, that’s a very useful player to have in your foursome.